How important is video to your brand’s content marketing strategy? A Cisco Systems visual networking study predicts that video will account for 82 percent of all internet traffic (both business and consumer) by 2020, up from 70 percent in 2015. You can view the study results as an infographic. But wait: the typical YouTube user is just some single guy, right? A scruffy millennial living in his folks’ basement. Uh… no. From 2015 to 2016, time spent on YouTube grew 80% faster among adults 55+ than among adults overall. YouTube reaches 95% of online adults 55+ in a month. More than 50% of YouTube’s audience is female, and YouTube users are more likely to have a college degree compared to the general population. So you need video in your content marketing. But you run into the same old problem: noise. There’s so much video competing for attention. How do you make your video stand out? you’re not constrained by actors, sets, props, etc. (an online video editor) to construct the videos. I create the storylines, write the scripts, find the music. My videos look different, which helps them stand out. Here’s a St. Patrick’s Day video I did for Coca-Cola. I think the above video succeeds because of the brand’s surprise appearance at the end. All that green, and then, boom!– the famous Coca-Cola red. 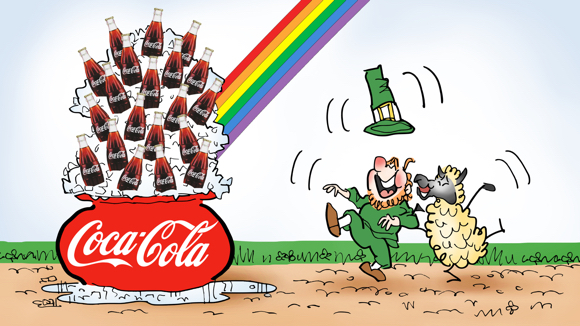 More importantly, it extols the brand in a way that’s so outrageous and over the top, you have to laugh: it wasn’t gold the leprechaun was after, it was something much more valuable: ice-cold Coca-Cola!! No one’s tried to sell you anything. You’re simply surprised, delighted, and amused, and you can’t help feeling good about the brand. You might also enjoy this Coca-Cola Valentine video. ← Happy Pi Day– SPLAT! O’ Baa, baa, black sheep, have you any ale? One for St. Patrick’s Day, when green is on display! For all the good cheer you bring, may the sun shine warmly upon your face, mon ami! 😀 Love all the expressions at 0.54 of your video. After Mt.Olympus, you’ve conquered the Irish too! BRILLIANT BRILLIANT animation, my dear friend BRILLIANT!!!!!!!!! St. Paddy’s may be gone but I’m sure the wishes are still …valid! Look! Here’s comes the illustrator!! He’s been telling everyone he’s been sick– a poor invalid!! But here he comes in a beautiful Rolls-Royce!! No, wait– he’s in a cardboard box being towed behind the Rolls-Royce. He just rolled out in a cloud of dust. Now he’s lying there, looking up at the sky. He’s wearing a dirty shamrock tie with ambrosia stains on it. Absolutely disgraceful. Now he’s sitting down at his computer, and he’s reading Marina’s last comment. Now he’s crying. Big fat tears splashing down on the keys. He’s pointing at the words on the screen and whimpering: “So beautiful! So kind! I don’t deserve it! I’m no good! !” Well, he’s right about that last part.